Modern footballers pale in comparison to players of old when it comes to application, discipline and mental toughness. Gone are the days when Patrick Vieira and Roy Keane couldn't stand the other's presence. Was it because they hated each other? No, It was due to respect. Neither could abide losing to a strong rival. Contemporary players have lost that competitive fire. It's a shame that, in large part, was brought about by social media. While a strong internet presence helps clubs connect with fans, it has its downside. Players crave validation from their followers on social media. They're more concerned with what people think about their personalities than their performance on the pitch. There are several ways the modern footballer is affected negatively by social media. Back in the day, players spent countless hours perfecting their skills on the training pitch. David Beckham was a social media pioneer for footballers and maintains a strong presence today but he still earned a reputation for exceptional free-kick and setpiece ability by staying late at the Manchester United training ground to work on his skills. The modem day footballer doesn’t seek to actively improve himself. Content with normal training ground routines, he punches the clock and focusses on personal business. Time and again, fans watch players fail to perform the most basic tasks in the pitch. Paul Pogba comes to mind. For all of his talent, the Frenchman isn't known for putting in extra time to work on his deficiencies. In fact, he's been heavily criticised for leaving United's EFL Cup defeat to Derby County early after showing off on social media. Paul Scholes can't understand why the new generation is so quick to apologise for bad performances. In his day, it was wrong for players to come out immediately after a game to acknowledge a poor outing. The best way to demonstrate your regret, according to the legendary midfielder, is to tear it up in the next game. In recent years, Arsenal players began tweeting immediately after a bad result. Knowledgeable fans were disappointed. They believed it was just damage control, a way to limit criticism. If you don't have the mental strength to accept criticism, how are you going to improve your play? 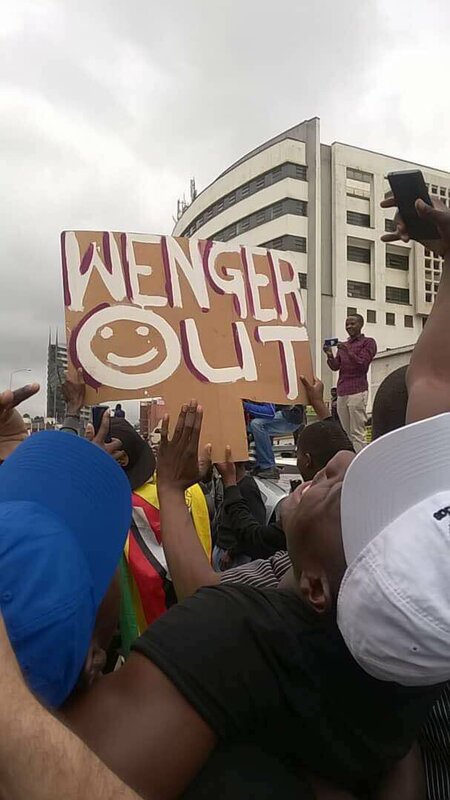 We've spotted a trend throughout 2017 – a sign keeps cropping up saying “Wenger Out”. We spotted it at a football match in Ethiopia, a concert in Kenya and even a protest demanding Zimbabwe's long-time President Robert Mugabe steps down. Social media has such a powerful effect, clubs now consider a player's online profile as an asset when in the transfer market. Paul Pogba and Neymar are top examples. Benjamin Mendy engages a lot with his followers, too. The French fullback rides the new wave of footballers active on social media, often to distraction. Manchester City manager, Pep Guardiola, publicly called on him to pipe down and concentrate on his football. It's a headache for many managers but a boon for the club's marketing arm. Players with large followers help clubs increase their profile on social media. Cristiano Ronaldo's signing boosted Juventus' online media presence. It helps the league, too. Suddenly, many more casual fans are interested in Serie A and a few less in La Liga. Football managers come under increasing scrutiny on social media these days. Arsene Wenger predicted fans would soon be able to influence substitutions via polls. It is not unusual to see clubs using social media to judge the popularity of managers before appointing them and deciding whether to fire them. Jose Mourinho's ability to send Twitter into viral apoplexy may be the major reason he remains Manchester United boss. Only when fan opinion completely believes he can't turn things around at Old Trafford will Ed Woodward and the United board be motivated to act. Every time Mourinho reminds the press how many trophies he's won in the past, another storm of debate over whether he can still deliver erupts online. More and more, opinion is driving football business rather than results. History will tell us whether that's a good thing.